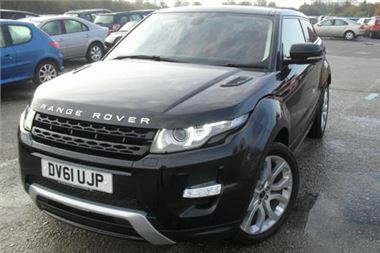 A Range Rover Evoque will be offered for sale next Monday (14 November) at BCA Derby. It will be the first to be sold at auction in the UK. The all new Range Rover Evoque is the smallest, lightest and most fuel efficient vehicle in the Land Rover range, emitting just 130g/km of CO2. The waiting list for a new Evoque is currently until March 2012. This particular example is a high specification 4WD model in Sumatra Black with Pimento Red/Ebony leather interior, a panoramic glass roof and 20" Sparkle Silver alloy wheels. The 61-registered car has only covered 51 miles from new and features Dynamic Stability Control, Electronic Traction Control, Hill Descent Control, Hill Hold and Roll Stability Control, Hill Start Assist and Cruise Control.